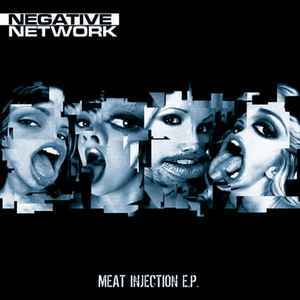 Negative Network ‎– Meat Injection E.P. The artwork is great and the artist and label are promising! Many years after its release and me buying it, I still enjoy the physical record, and the songs themselves as well of course, a lot! We have here the well known industrial/terrorcore artist Negative Network with just a slight "frenchcore" touch, to be ingrained nicely into the Audiogenic sphere. A1 "Broken Insects", is one of my all time favo tracks on this label, and one of the hardest we find on the Audiogenic releases. A bit faster than most of the tracks on this label, it clocks in at a nice 240 BPM. A typical frenchcore bass preceded by an intro of industrial sounds, which make one think of a typemachine and some other machiens operating in a large industrial hall, thanks to the reverb we hear on the FX soundz. Not so much distortion as in "Dirty Clickz" here, but it's faster. At the later part of the song we find first somewhat of a next break and subsequent build up, now we get an extra weird synth and some screamz! Here is where this song reaches climax. Get ready for a good old industrial terror track! Great and after many years it's still one of my fav terrorcore tracks, a vinyl that served many times in bringing beatz into my ears through the air! unleashing industrial hell! A2 "Trust me". A track which utilizes a frenchcore kick which is found in older Joshua tracks, a bit more distorted by Negative Network. Some weird FX soundz, which bounce along with the beat, giving it a funky groove without being too cheesy or happy. As all tracks on this release, we have something "frenchcore", yet a far cry from the happy and cliché things we have heard in subsequent years. Here is Negative Network giving his own interpretation of a genre he makes all the more interesting because the end product satisfies the persons who want banging core that doesn't sound all too boring or cheesy. Track B1 "Terminated" then, starts with a nice intro, sampling a well known movie about robotic Terminators. After the short into, which becomes all the powerful thanx to the excellent selected vocals, we get a typical frenchore kick, accompanied by some sounds we already know from Joshua's Striking Wave samplepack, fitted all together very creatively and precisely by Negative Network. B2, which has a harsher bassdrum. To call it "Dirty Clickz" was only fitting, and we get here a song where both the sounds and kicks are very distorted, accompanied by a low-subby robotic voice. you migh even start enjoying the rhythmic voice saying "negative network.. click click click" and then when the kick comes in again! you have a banger again to enjoy! Quite some original sounds in all of the songs, accompanied by fast and hard bassdrums. I actually always thought Broken Insects and Trust Me were the B side and Terminated and Dirty Clikz were the A side. I only learned the proper order by writing this review.